I’ve had this book on my to-read list since it came out and I am glad I finally had the opportunity to read it, as I usually enjoy DiCamillo’s work immensely. Flora & Ulysses is no exception! Because the beginning is so quirky and over-the-top in its humor it took me about 20-30 pages before I truly settled in to enjoy the read. I wasn’t sure–as a reader–if I was supposed to be empathizing with Flora’s anger and frustration with her parents and her situation or if I was supposed to arrive at the same conclusion as Flora: that Ulysses, the squirrel, is a superhero. As soon as I got a small glimpse into Ulysses’ thoughts his first night in Flora’s house I realized that it didn’t matter if he was a superhero in the traditional sense or not. When I stopped trying to figure that out in order to make sense of the plot the rest of the story seemed to open up and I didn’t stop reading until I reached the end. I couldn’t put it down and when I finished I wanted to start it all over again! Flora’s lonely journey, made less solitary thanks to Ulysses is another lovely melding from DiCamillo of love and friendship and acceptance, of the extraordinary in the typically ordinary people and details of our lives. Flora & Ulysses is a blend in tone of DiCamillo’s Tale of Desperaux and The Miraculous Journey of Edward Tulane with the addition of a couple short pages of panels detailing Ulysses’ exploits. Ulysses provides a reflection of the poet’s soul and the individual creation process for writing as he creates poetry that is both liked by some and derided by others. Some moments of the story are outlandishly, delightfully silly and others are full of warmth and inspiration (one of DiCamillo’s most striking gifts as a writer). 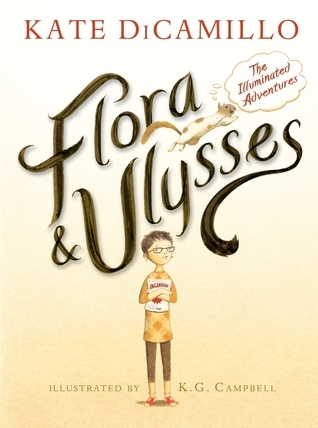 Flora & Ulysses are both quirky and loveable and so is their story.